Microsoft introduced the System Restore features in Windows XP, but it was so badly done that most of the backups cannot be used to recover the system. With Windows 7 and 8, Microsoft has put in great effort to improve the System Restore feature, and it is now a viable option for everyone, especially for people who don’t bother with regular system backups, to keep their system in order. For those who are not aware, Windows system restore is a native feature in Windows XP/Vista/7/8/8.1 that saves your PC from corruption by restoring it to a previously known good condition. System restore points in your machine can be created manually, or automatically, and can be triggered whenever you are installing software, drivers, or Windows updates, etc. Whenever a system restore point is created, Windows will take a snapshot (kind of) of the current state. So whenever you restore to previous settings, Windows will restore many of the important files like system files, registry settings, program files, system settings, etc. Note: Even though we are showing this in Windows8/8.1, this procedure will work with Windows 7. Before configuring Windows system restore in your Windows machine, you need to make sure that this feature is already activated. By default, system restore is enabled for your C drive (OS installed drive). If system restore is not enabled by default, follow the steps below to enable and configure it. 1. Press “Win + X” and select “System” from the list of options. This will open up the system details window. 2. Now click on the “System Protection” link displayed on the right side of the window. 3. The above action will open the “System Protection” tab inside the “System Properties” window. 4. Scroll down to the “Protection Settings” section, and check to see if your OS drive has protection status “on.” If not, select it and click the “configure” button to continue. 5. The above action will open the system protection window for your selected disk. 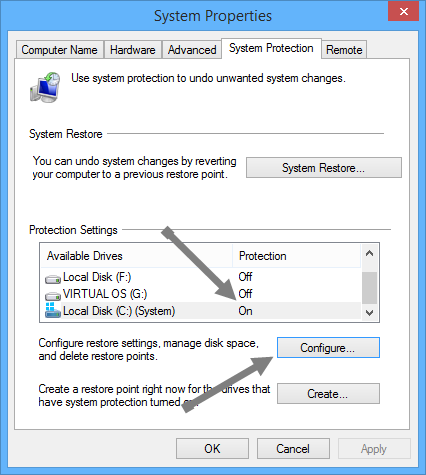 Here select the check box “turn on system protection” to turn on or enable the system restore feature. 6. Once the system restore feature is enabled, you can configure how much disk space the system restore feature can use by dragging the slider next to “Max usage.” Obviously, the more space you allot, the more restore points can be saved. 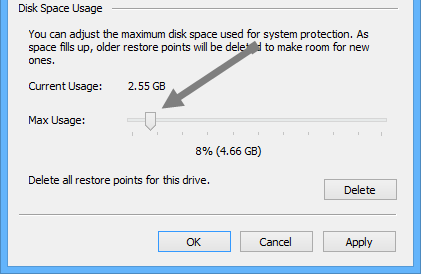 When the allocated disk space is filled, Windows will delete the old restore point to make space for the new one. 7. If you want to delete all the previously created restore points, just click on the delete button next to “Delete all restore points for this drive”. Even though the system restore feature is useful and a life saver at the time of emergency, it consumes a considerable amount of disk space. Disk space is not a choice if you are using laptops with little disk space or if you have an SSD for your OS installation drive. 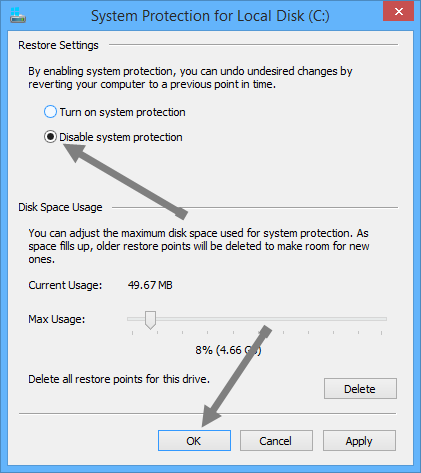 If disk space is of a concern to you, you might want to disable the System Restore feature. Open up the “System Protection” window (follow steps 1 to 3 above) and select your drive under Protection Settings and click on the “Configure” button. Here select the checkbox “Disable system protection” to disable system restore and click on the Ok button to save the changes. Note: Though disabling the system restore feature in Windows frees up the hard disk space, it is always a good idea to have regular backups so that you won’t face any awkward situations like losing data or completely re-installing the operating system. What is Password Hashing and How Does It Work?